ARR! 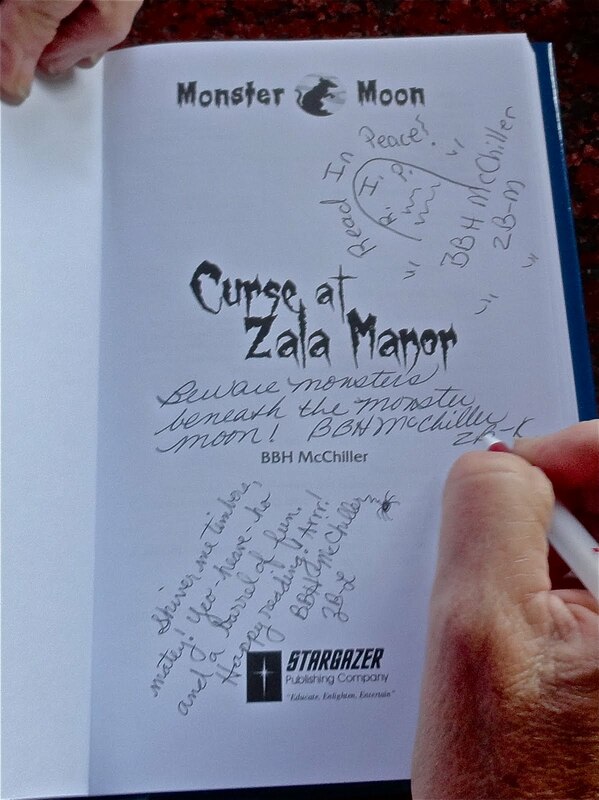 Let’s give a great big hook hand to Rebecca Kiel, who will receive a copy of SECRET OF HAUNTED BOG, and Tina Laurel Lee, who will get a copy of CURSE AT ZALA MANOR. Heather Kelly’s blog last week earned their rewards. Send yer addresses, mateys, and we’ll ship ’em right out. 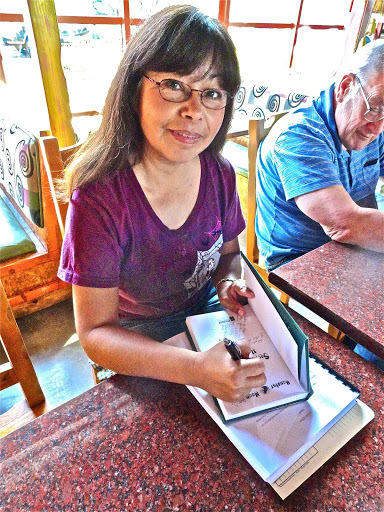 Maria signs a copy of SECRET OF HAUNTED BOG, newest release in the series. SECRET OF HAUNTED BOG, second book in the Monster Moon series for kids ages 8 – 12. CURSE AT ZALA MANOR is the first book in the series. Rebecca and Tina will receive a book signed by all three authors! ZB-K (Kathy), ZB-L (Lynn), and ZB-M (Maria). For more info on the Monster Moon books, you can read my blog post here. That’s pirate speak for making a celebratory toast. Cheers, mateys! This entry was posted in Authorly Stuff, Books, Curse at Zala Manor, Secret of Haunted Bog and tagged children's books, Curse at Zala Manor, Heather Kelly, Kathy Sant, Maria Toth, Monster Moon Mysteries, Secret of Haunted Bog, Uncategorized. Bookmark the permalink. 15 Responses to MONSTER MOON – Show Me The Bounty! Congratulations to the winners. A book signed by all three authors is a great gift. Hey Lynn, I'm so happy for all of you. Congratulations again! I love the look of these books. How great to win a summer of fun reading. Congrats to the winners and to the writers on another project completed and published! Helen – Yes, I'm glad I was able to get both Kathy and Maria's signatures for the giveaway books. Sometimes it's hard to get all of our signatures in the midst of hustle and bustle.Stephanie – Thanks so much. I'll pass your well wishes on to Kathy and Maria.Thanks, Lee. We love the covers the illustrator did. Greg Martin is awesome.J.L. – Thanks! I know you can relate to the rewarding feeling of seeing the book finished and making its way into the world!Hi Lisa – Yes, if your daughters like fun, spooky mysteries, they'll like the Monster Moon books. Thanks! Congrats to the winner. What a fab prize! So excited!!! We have had tons going on around here lately. Where are the lazy days of summer??? I will get you that address toot-sweet!Love the pirate talk! Thanks again, Lynn, for the awesome giveaway! And for the great interview. What fun we had!! I love that you had the books signed by all authors–so special. How cool. Congrats to the winner, will be well-chuffed. Love the covers of the books. Thank you Lynda, Misha, Tali, and Theresa.Tina – I'm excited to get the book into your hands. Thanks for your awesome questions/comments.Thanks again, Heather. You're great at interviewing and supporting other writers. You made it all so much fun. Basically, you rock big time!DUO – Thanks! We love the book covers, too. Greg Martin, the illustrator, is the best!